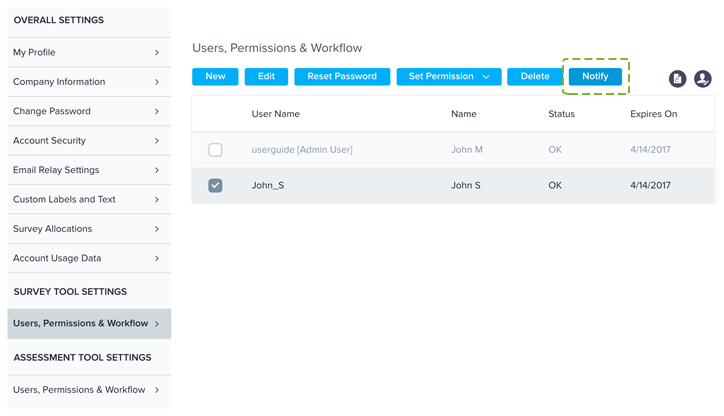 The ‘Users, Permissions & Workflow’ section allows you to create sub-accounts and assign them permissions for various sections of the platform. Click Users, Permissions & Workflow under Survey Tool Settings in the menu on the left. Enter the details and click ‘Save’ or ‘Save & Go back’. You can give administrator rights to a sub-user. Under Users, Permissions & Workflow, select the sub-user you wish to edit and click the Edit button. 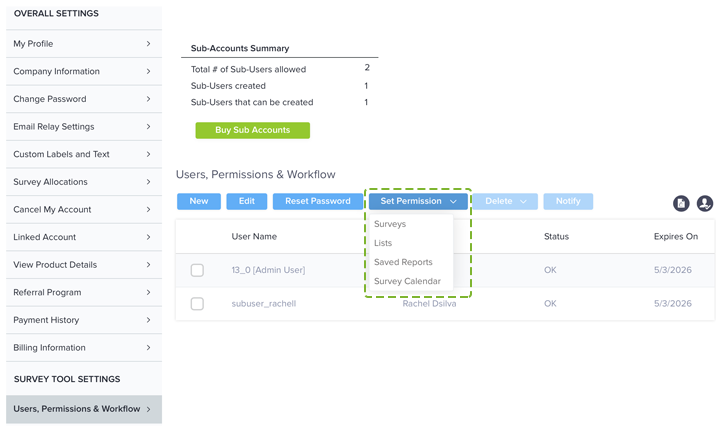 Under Users, Permissions & Workflow, select the sub-user, and then click Reset Password. You will need to enter the admin user password and the new password for the sub user. Click Save to reset the password. You can set permissions for the Surveys, Lists, Saved Reports and Survey Calendar for each sub-user. So, you decide what each sub-user sees in his or her account. In the Users, Permissions & Workflow section, select the sub-user you need to assign permissions to. Click the Set Permissions dropdown menu, then select Surveys. The Survey permission section is divided in two sections. Review your options. 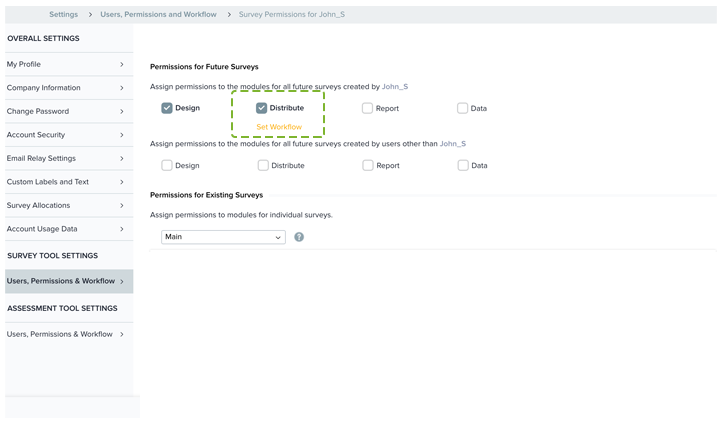 Permissions for Future Surveys: Here you can check the relevant boxes to assign module-level permissions for surveys that will be created in the future by this sub-user or other account holders. Sub-users will see only the modules and surveys they have been permitted. You can assign permissions to the sub users for the existing surveys here. The dropdown menu displays all the folders in the administrator account. All the surveys in each folder will be listed below. Assign the desired permissions and click on ‘Save’ or ‘Save & Go Back’ button to save them. The sub-user will require special permission from the Workflow Manager. When enabled, the sub-users will be prompted to ask for permission when they try to distribute a survey. The Workflow Manager will then receive an email asking to grant or deny the permission. 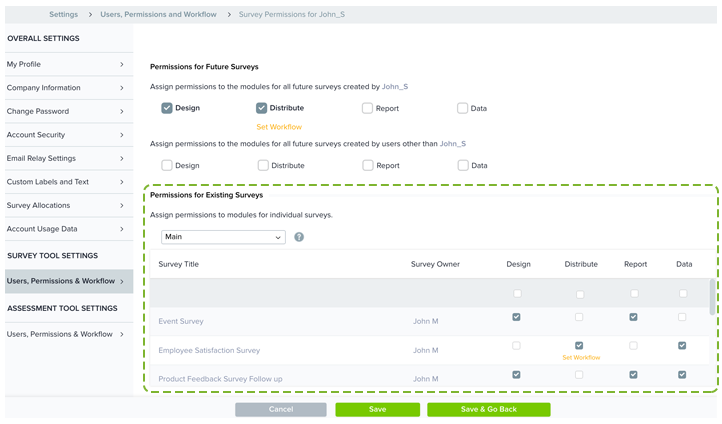 The sub-user can distribute the survey only after the Workflow Manager grants permission. In the Users. 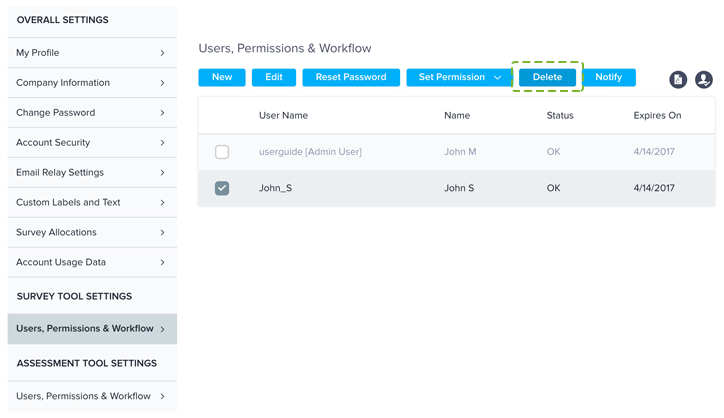 Permissions & Workflow section, select the sub-user you need to assign permissions to. Click the Set Permissions dropdown menu, then select Lists. 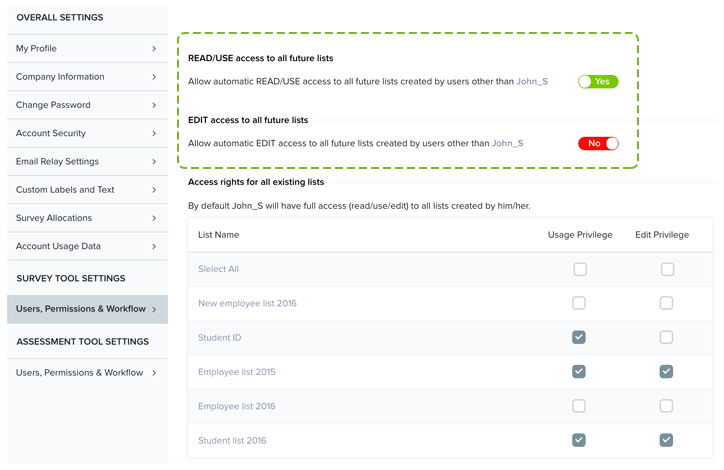 Here you can assign permissions to READ/USE or EDIT existing lists or the ones created in the future by users other than the sub-user personally. By default, sub-users will have full access to all lists they create. Click the Set Permissions dropdown menu, then choose Saved Reports. Here you can assign permissions to existing Saved Reports or the ones created in the future by users other than the sub-user personally. By default, sub-users will have access to all Saved Reports they create. 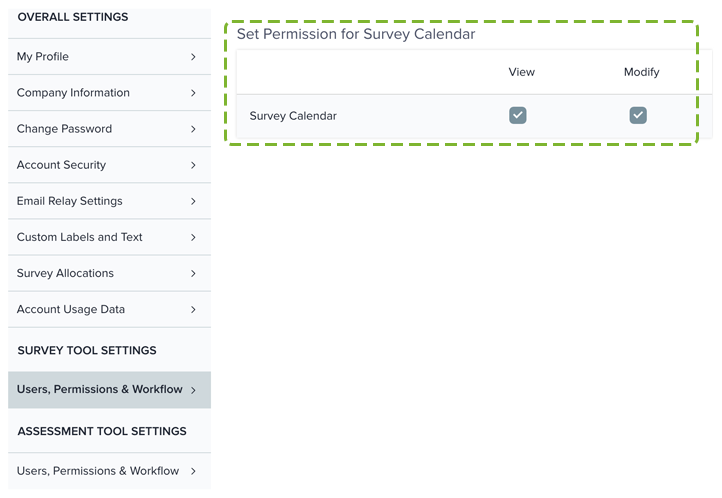 Click the Set Permissions dropdown menu, then select Survey Calendar. If you have already assigned permissions for a sub user and wish to copy them over for another user, just click the ‘Copy permissions from other user’ icon on the top right of any of the Set Permissions pages. 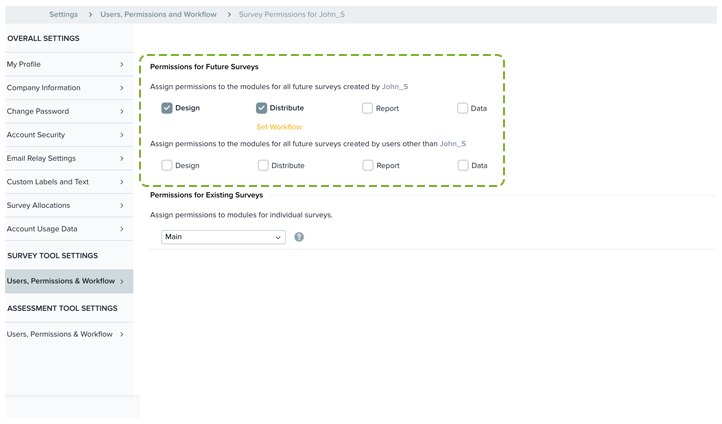 You may then select the sub-user and also choose to grant permissions for existing and future surveys. 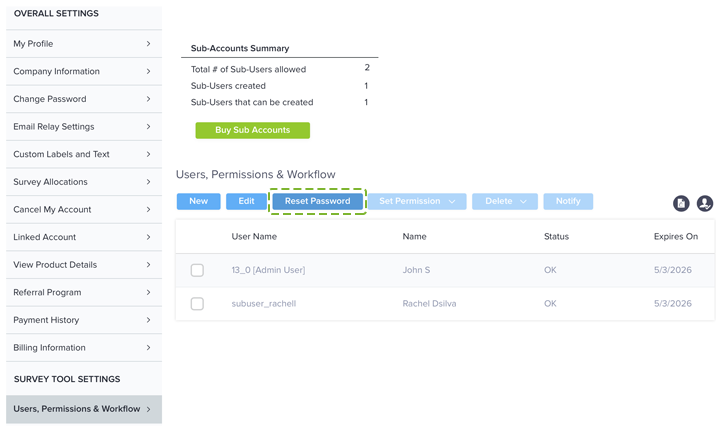 In the Users, Permissions & Workflow section, select the sub-user you wish to delete. Click the Delete button. Confirm, and the sub-user account will be deleted. This feature allows you to inform each new sub-user of the account creation. An email is sent to the sub-user containing SoGoSurvey login information. Use this feature whenever you create a sub-user. 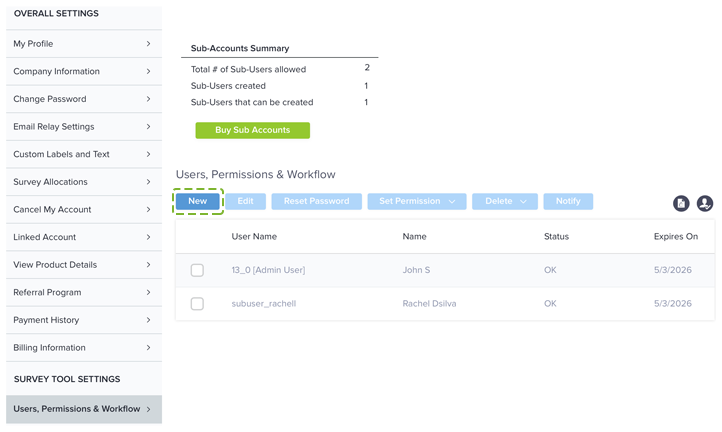 In the Users, Permission & Workflow section, select the sub-user you wish to notify.